Annie Louisa Swynnerton (1844-1933), The Sense of Sight (1895), oil on canvas, 87.3 x 101 cm, Walker Art Gallery, Liverpool, England. Wikimedia Commons. At first sight, as painting is one of the visual arts, it might seem simple to paint on the theme of sight. In some sense, every painting is necessarily about sight, but some are more explicit depictions of the sense, and others merely assume its existence. As with the other senses that I have considered in this series, I will look first at what are commonly accepted as being allegories of the sense of sight. Strictly speaking, there is no meaning hidden in these works, so they are not true allegories, but the term has stuck. Frans Floris (1519/1520–1570), Allegory of Sight (date not known), oil on panel, 95.8 × 81.3 cm, location not known. Wikimedia Commons. I am not sure when Frans Floris’s Allegory of Sight was painted, but it was probably around 1550, making it an early and quite sophisticated entry to the subject. The face of its figure is shown reflected in the only appropriate optical instrument of the day: a simple mirror, which is angled carefully so as to project most of the face. Although only a small feature, that reflection looks fiendishly difficult, given the wildly different angle between the mirror and the picture plane. Floris includes two other symbols related to sight: a window, which shows a heavily-overcast sky but does not provide the main illumination for the scene, which comes from the left, behind the viewer, and, in the foreground, a bird of prey, probably as a small statue of an eagle, known for its exceptionally keen vision. José de Ribera (1591–1652), Allegory of Sight (1615-16), oil on canvas, dimensions not known, Museo Franz Mayer, Mexico City, Mexico. Wikimedia Commons. By the early seventeenth century, José de Ribera had worked out a very different approach for his Allegory of Sight (1615-16). 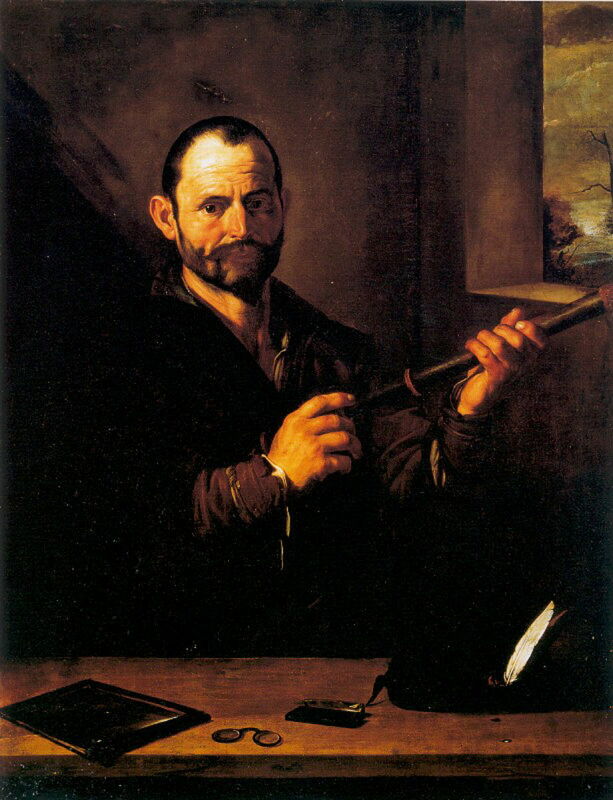 Painted just a few years after the appearance of the first working telescope in 1608, Ribera shows a man surrounded by these wondrous new inventions, as well as a traditional flat mirror. In his hands is an early telescope, possibly made in the Netherlands or Germany. Next to the mirror is a pair of spectacles, which had been developed from the middle of the thirteenth century. Next to them is what may be a small handglass, but the details are obscure in this image. Jan Brueghel the Elder (1568–1625) and Peter Paul Rubens (1577–1640), Sight (1617), oil on panel, 64.7 x 109.5 cm, Museo Nacional del Prado, Madrid. Wikimedia Commons. 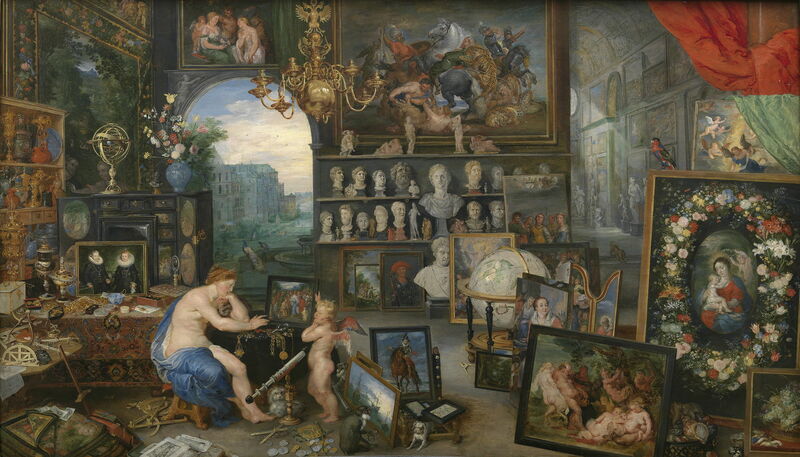 Shortly after that, Jan Brueghel the Elder and Peter Paul Rubens collaborated on their magnificent series of five allegories, including Sight (1617). 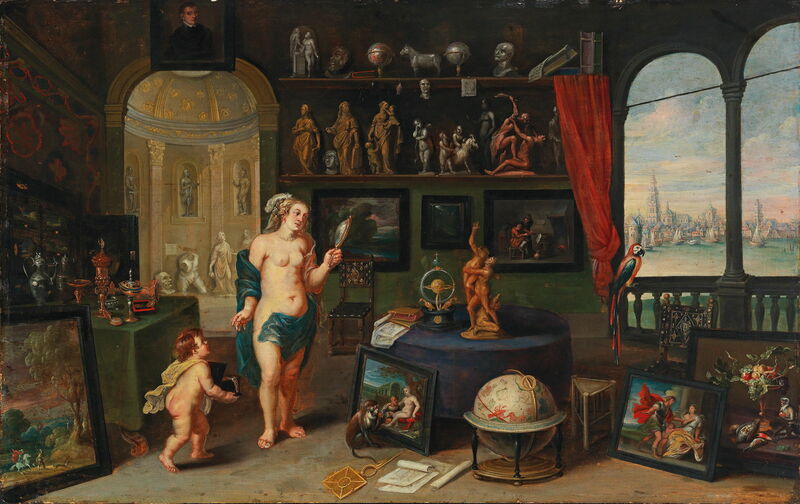 Among the cornucopia of visual and optical artefacts shown here is an even more sophisticated telescope, various drawing and navigational instruments which relied on sight (for making sightings), an early magnifying glass, a globe and an orrery (showing the orbits of the planets), and a vast collection of visual art, including paintings and sculpture. There are some obvious figurative items, such as the peacocks shown in the distance, just above the woman’s head: their feathers have eye-like markings, and refer to the well-known myth of Argus, although I cannot see that in any of the paintings within this painting. Frans Wouters (1612–1659), Allegory of Sight (1635–59), oil on panel, 56.5 × 89.2 cm, location not known. Wikimedia Commons. Frans Wouters provides a brief resumé of Brueghel’s painting in his Allegory of Sight (1635–59), which sadly lacks the optical instruments, but features an unusual convex mirror, being held by the figure. 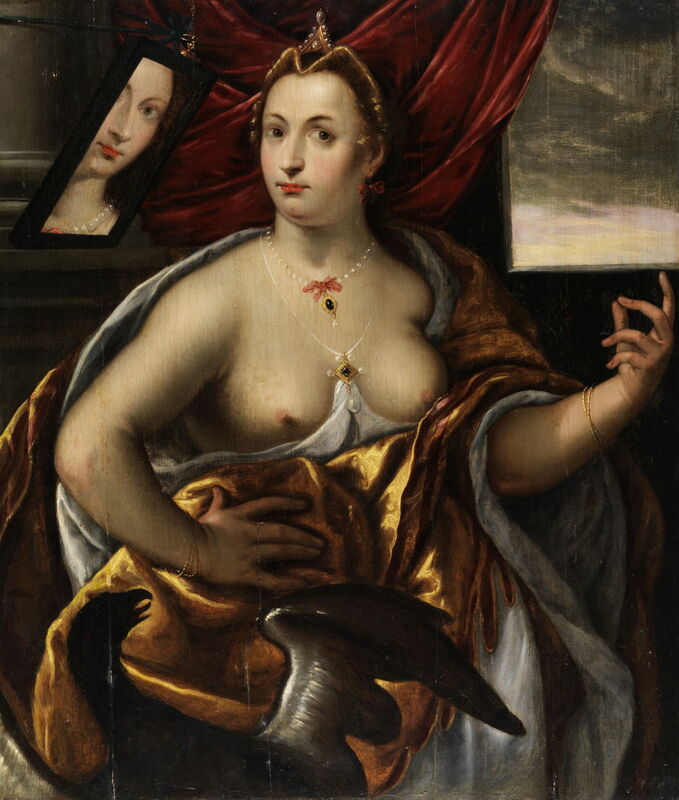 Abraham Janssens (1567–1632) (attr), Sight (date not known), oil on canvas, 117 × 93 cm, location not known. Wikimedia Commons. This painting of Sight has been attributed to Abraham Janssens, and could date to any time between about 1590 and 1632. 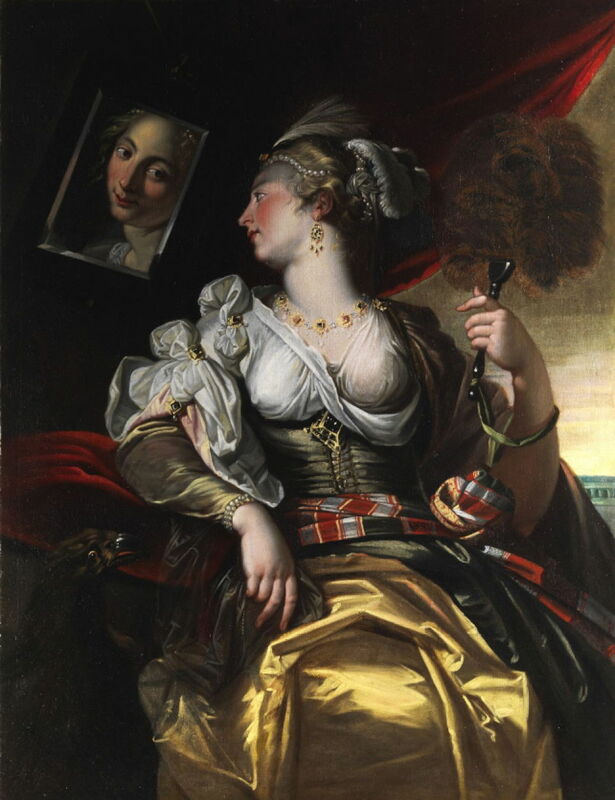 It appears to have been inspired by Floris’s Allegory of Sight, and its figure is more modest in her dress. The eagle is almost lost in shadow, but is less statuesque at the bottom right. Unfortunately, the reflection of the woman’s face in the mirror does not appear optically correct. Pietro Paolini (1603–1681), Allegory of the Five Senses: Sight and Touch (date not known), oil on canvas, 162 x 163 cm, Private collection. Wikimedia Commons. Pietro Paolini’s Allegory of the Five Senses: Sight and Touch was probably painted around 1650, and shows how effective it is to contrast opposites. In the centre is a blind man, who is simultaneously touching the smooth surface of a painting with his left hand, and a sculpted head with his right. Holding the painting is a younger, sighted man. Philip Mercier (c 1689-1760), The Sense of Sight (1744-47), oil on canvas, 132.1 x 153.7 cm, Yale Center for British Art, New Haven, CT. Wikimedia Commons. With the loss of enthusiasm for allegorical paintings of the senses, the next significant work appeared nearly a century later, in Philip Mercier’s The Sense of Sight (1744-47). 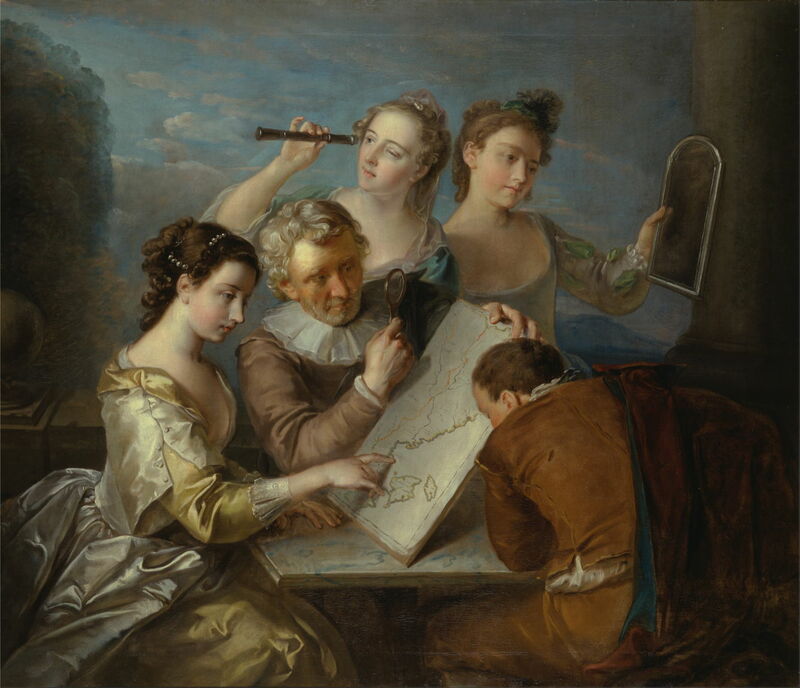 Most of the other works in this series have involved a cast of two young couples; here he uses a man, his three daughters, and son, who display three optical instruments in use: a flat mirror, a small collapsible telescope, and a magnifying glass. One of the daughters is tracing with her finger on a chart of what appears to be the eastern coastline of North America, and the son is looking intently at another map underneath. 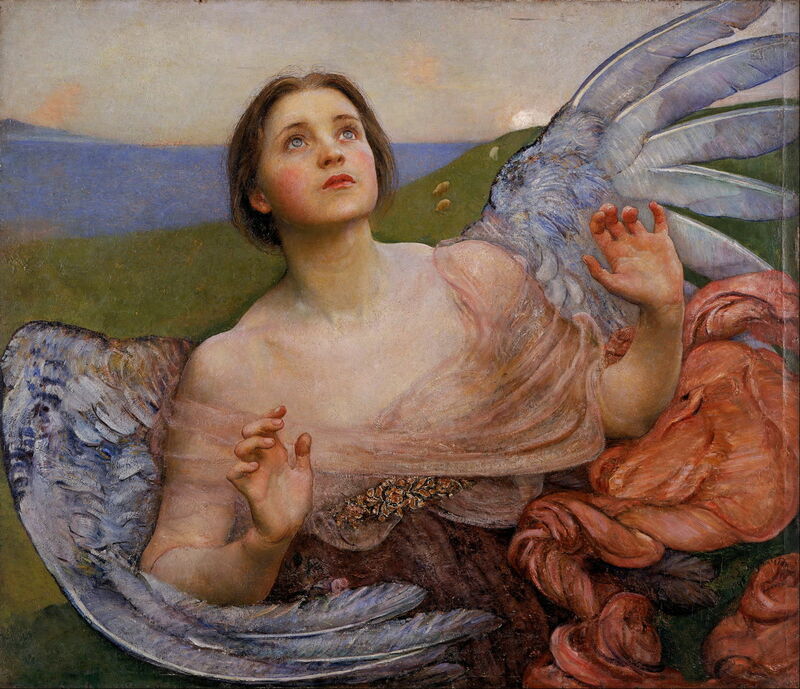 But my favourite depiction of The Sense of Sight wasn’t painted until 1895: it is this, Annie Swynnerton’s masterpiece. Her single figure has no need for optical instruments or paintings: looking up to heaven, her eyes, expression, and body language speak of only one thing. Our sense of sight is also celebrated in a peculiar, ancient, and very widespread game which is played by children and adults alike: blind man’s buff (or bluff). This involves putting a blindfold on the ‘victim’, who is then required to ‘tag’ one of the sighted players. It was recorded in ancient Greece, and more recently is known from much of Asia, including Japan, throughout Europe, and the Americas. Although it has been introduced to Australasia by European settlers, I do not know whether it has been recorded among indigenous peoples there. The game also rejoices under many fascinating names: in ancient Greece it was known as copper mosquito, in Bangladesh as blind fly, in Germany as blind cow, and in France as Colin-Maillard, after a tenth century warrior. Jean-Honoré Fragonard (1732–1806), Blind-Man’s Buff (1750-52), oil on canvas, 116.8 x 91.4 cm, Toledo Museum of Art, Toledo, OH. Wikimedia Commons. 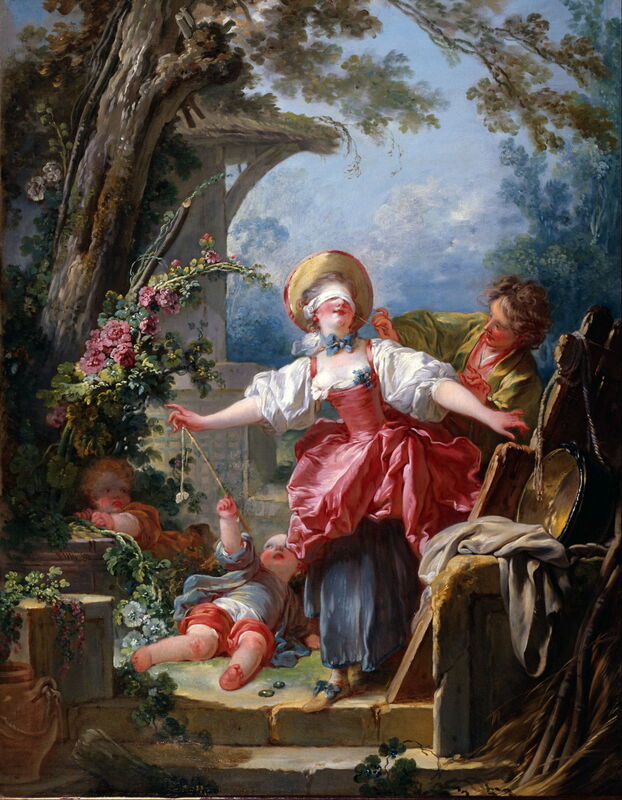 Fragonard’s Blind-Man’s Buff (1750-52) shows a red-faced young woman wearing the blindfold, being teased by her young man, and a child using a simple fishing rod. Her torso is tightly constricted by a tubular corset which gives her what appears to be an anatomically-impossible figure, and if she is not very careful, she will fall down the stone steps in front of her. Francisco Goya (1746–1828), Blind Man’s Buff (1788), oil on canvas, 41 × 44 cm, Museo Nacional del Prado, Madrid. Wikimedia Commons. 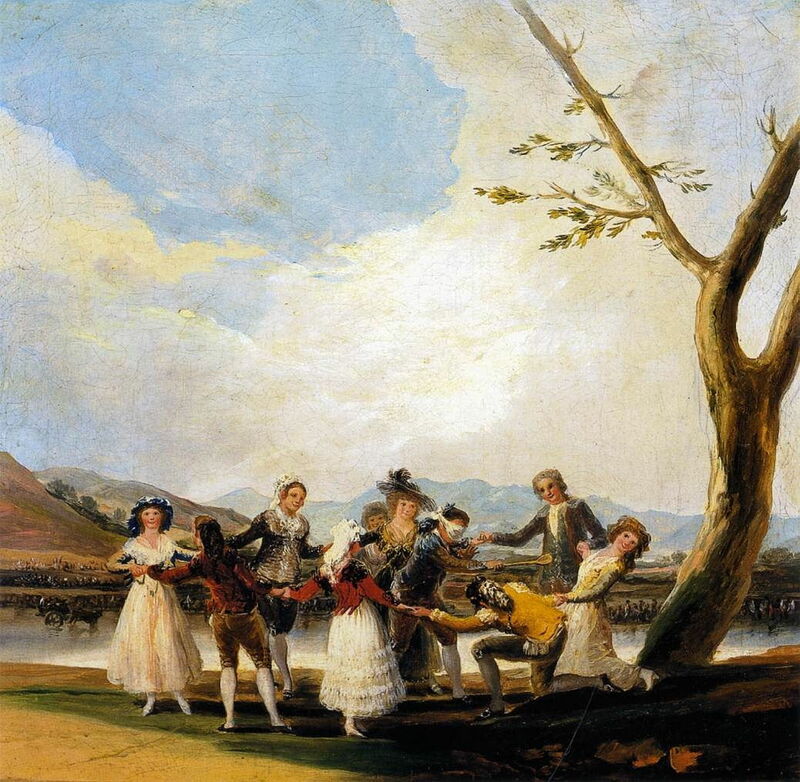 Goya shows a more usual form of Blind Man’s Buff (1788), in which the sighted players hold hands and form a ring around the blindfolded ‘victim’. Although this should provide them with more safety, this group has chosen to play on the bank of a river. Konstantin Makovsky (1839–1915), Игра в жмурки (Blind Man’s Buff) (c 1895), further details not known. Wikimedia Commons. 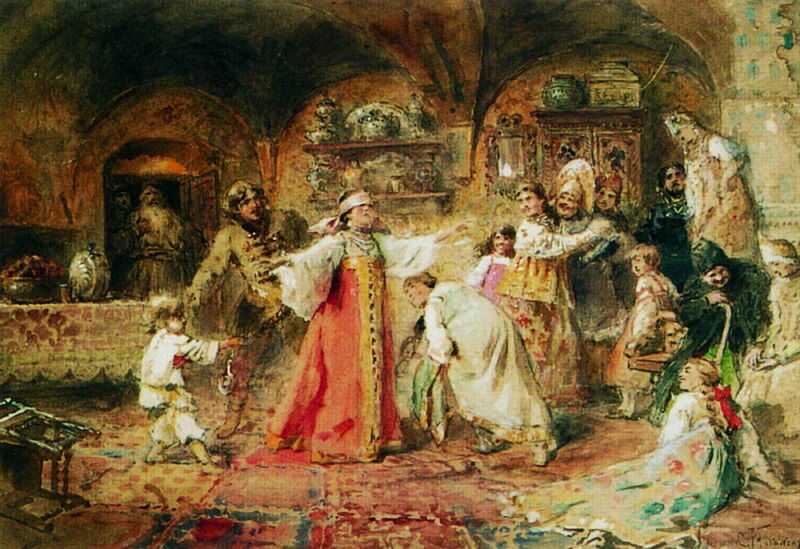 Konstantin Makovsky’s Игра в жмурки (Blind Man’s Buff) (c 1895) shows another variant, being played indoors. 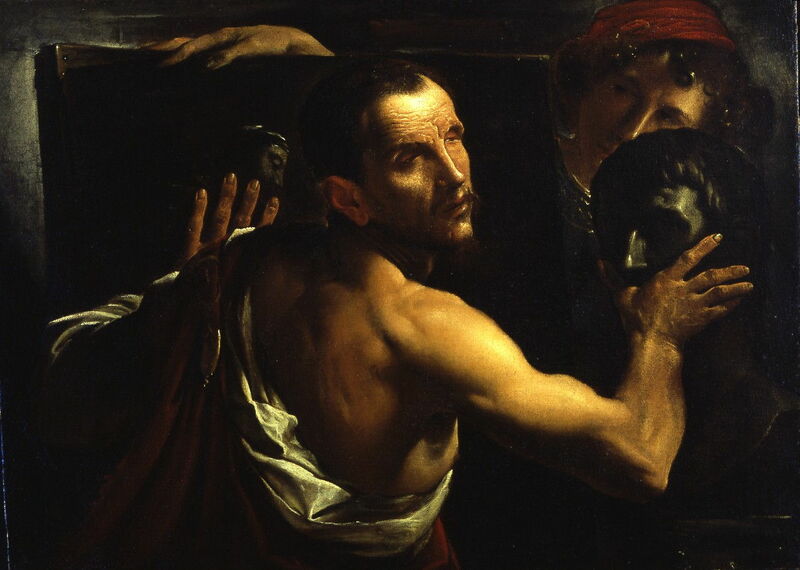 To those, we should perhaps add the many paintings showing Samson when he had been blinded, and the innumerable works which depend on the direction of gaze. Perhaps another time. Posted in General, Language, Life, Painting and tagged allegory, blind man's buff, Bruegel, Brueghel, Floris, Fragonard, Goya, Janssens, Makovsky, Mercier, painting, Paolini, Ribera, Swynnerton, Wouters. Bookmark the permalink.